Based on the expertise of Stainless Steel Valve Industry, Yi Kang Industrial has inputted development and manufacture of Stainless Steel Valve products. We not only have the top-ranking suppliers' coordination but also have an outstanding management team. Yi Kang Industrial is a professional manufacturer of Stainless Steel Ball Valve, Stainless Steel Solid Ball, and Precision Hollow Ball Process, which owns the best mechanical equipment, the best technical skill, as well as the best specialized QC to manufacture high-quality products as our Operations Philosophy. We not only have complete processing equipment but also have a strict quality control in each stage of the production process from Raw Materials Cutting, External Circular Processing Ball Valves, R'ANGLE Ball Valves, Slotting, Tribology, Polishing, QC Packing to Produce Goods are accomplished under one roof. Besides, we also provide our customers with omni-directional services. We have the rigorous QC system and testing equipment, such as Platform Measurement, Symmetrical Measurement, Roundness Measurement Instrument, Surface Machine and so on to manufacture customer demanded products. 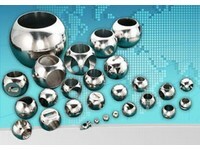 Yi Kang Company manufactures 1-4 Way Stainless Steel Solid Ball , L-Port Stainless Steel Solid Ball , T-Port Stainless Steel Solid Ball , X-PORT Stainless Steel Solid Ball , V-PORT Stainless Steel Solid Ball , Stainless Steel Solid Ball with a Special Groove , Shaft Solid Ball, Oblate Ball, Hollow Ball, Fixed Ball and so on (12-inch maximum diameter, 1/4-inch minimum diameter). Wide ranges of specifications are available for customers' special demands . We appreciate your supports and cherishments for Yi Kang Company, and we'll hold the conception of Business Operation "Innovation", "Quality", "Service", "Efficiency", and "Business Continuity" to provide you with specialized skills and high-quality services with the highest enthusiasm. We also welcome your inquiry and precious opinions. New product, new technology, new knowledge, and new thought of management. The clients' expectations must be remembered carefully; to achieve the clients' satisfaction with teamwork. Delivery on time; quality assurance; to maintain the clients' rights and interests, cope with the clients' complaints, and take the best satisfaction as our target. Yi kang Industrial Co., Ltd. demands high work efficiency from the three major units of production, sales, and management to strengthen the competitiveness in the international market. Yi kang Industrial Co., Ltd. enables the team, the clients, and the suppliers to grow in stability together through the mission of perpetual operation.